AWS OpsWorks Stacks needs to interact with a variety of AWS services on your behalf. For example, AWS OpsWorks Stacks interacts with Amazon EC2 to create instances and with Amazon CloudWatch to obtain monitoring statistics. When you create a stack, you specify an IAM role, usually called a service role, that grants AWS OpsWorks Stacks the appropriate permissions. Have AWS OpsWorks Stacks create a new service role with a standard set of permissions. The role will be named something like aws-opsworks-service-role. Specify a standard service role that you created earlier. You can usually create a standard service role when you create your first stack, and then use that role for all subsequent stacks. Specify a custom service role that you created by using the IAM console or API. This approach is useful if you want to grant AWS OpsWorks Stacks more limited permissions than the standard service role. To create your first stack, you must have the permissions defined in the IAM AdministratorAccess policy template. These permissions allow AWS OpsWorks Stacks to create a new IAM service role and allow you to import users, as described earlier. For all subsequent stacks, users can select the service role created for the first stack; they don't require full administrative permissions to create a stack. 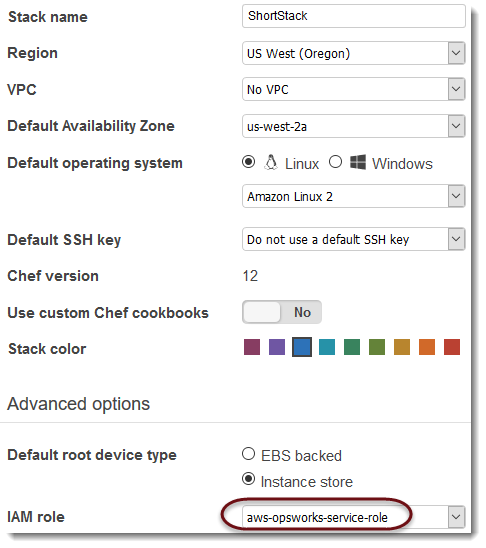 Perform all Amazon EC2 actions (ec2:*). Use Elastic Load Balancing to distribute traffic to servers (elasticloadbalancing:*). Use an Amazon RDS instance as a database server (rds:*). Use IAM roles (iam:PassRole) to provide secure communication between AWS OpsWorks Stacks and your Amazon EC2 instances. If you create a custom service role, you must ensure that it grants all the permissions that AWS OpsWorks Stacks needs to manage your stack. A service role also has a trust relationship. Service roles created by AWS OpsWorks Stacks have the following trust relationship. If you are using the Create Role wizard in the IAM console, specify the AWS Opsworks role type under AWS Service Roles on the wizard's second page. If you are using a AWS CloudFormation template, you can add something like the following to your template's Resources section.